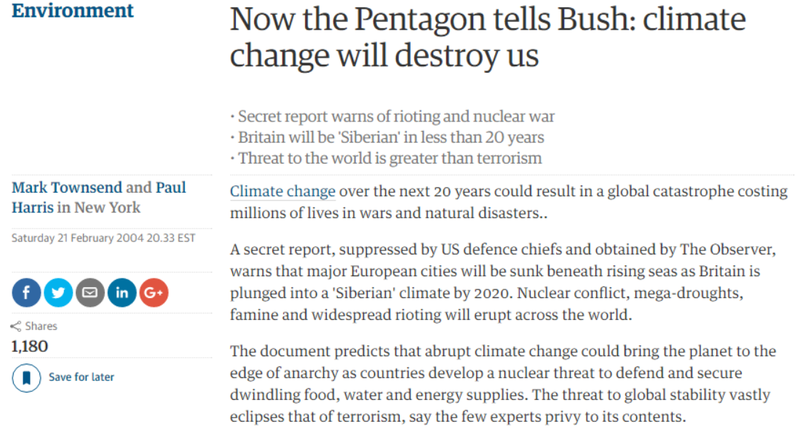 Crack experts in the US military said that Britain will have Siberian climate by 2020, cities will drown and nuclear war will break out. And the idiocy continues today. Does the Military believe they can combat climate change? Or do they plan to adapt to it? This is why when someone asks the definition of oxymoron, the first example that comes to mind is “military intelligence”. While they are beating back the threat based on ‘actionable science’ fiction, they should incorporate an additional level of bureaucracy to confront the threat of climate change invaders from Barsoom (Mars) due any time riding their mighty steeds to unleash their wrath upon all Earthlings. Climate change is a terrible thing, here, and on the Red Planet, er, so they say. Maybe the Navy is worried that sea level rise will mean that their ships will have less freeboard . Either less freeboard, or that Guam might be even more liable to tip over. I think both are equally likely. I am just waiting for warmunists to claim lack of sea level rise in certain places on the west coast, is because those places on that side happen to be floating. Of course if they really are floating, then maybe they COULD tip over. Russia, today, just sold MILLING QUALITY WHEAT into N. Africa for $170 US delivered. It is to be used as animal feed. We are so oversupplied in wheat in the world today that we are feeding bread quality to goats. Russia has nukes and they are shoveling food out the door. 2020 is 3.5 years away. There are enough nut-jobs in the world that I wouldn’t bet against some nukes flying, but it won’t be about food or weather. OT, but another steep drop in UAH global. Every US military unit will have a climate commissar who will report directly to the Whitehouse. Any military officer stupid enough to question the paradigm will be denounced by the commissar and cautioned about imperialistic thoughts. A second infringement will see the officer court martial led for climate treason. When in action, the commissars will ensure that the troops kill the enemy in a sustainable and environmentally appropriate way. Battle tanks will be solar powered and both sides must agree to a cessation in hostilities whilst charging is taking place. Global Warming is “World War lll” !! It just goes to show ya, and “who” could have thought, (Besides Al Gore and the Little Hay-Hoe of Texas? ), Global Climate/Warming/Cooling/Ocean/Lake/Mountain/Desert/Valley/Tropics/SubTropics/Arctic/Antarctic/Himalayan/Alps/Rockies/Coastal Range/Indies/Alaska Range/Wasatch/Cascades/Sierra/Pinatubo/Urals/Kilimanjaro lack of snow and ice would cause World War lll ? And to think of it, all this caused the uprising of ISIS (An Egyptian God), all because off, oh, just see the above ??? Good enough for Me, Good Night America, Sweet Dreams ! Oh and, Sleeping at least 3ft underground will help protect you from Radiation Poisoning, but that’s just Me ?